Although most of the leading Jewish communists in Europe were Jews of Ashkenazic origin, there were a substantial number of Sephardim who were active in Socialist and Communist movements as well, particularly in Yugoslavia . One of the senior Communist leaders in that country was a Sephardic Jew  by the name of Moshe (Mosa) Pijade (1890-1957), a close confidante of Yugoslavian leader Marshal Josip Broz Tito. 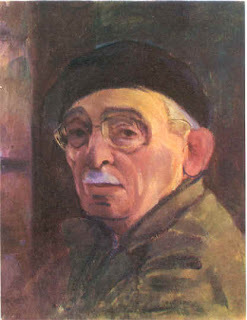 Pijade (self portrait) was born to a prominent Sephardic Jewish family of Bulgarian origin in Belgrade, Serbia. He first went to study art in Munich and Paris but soon took up Journalism and developed a penchant for radicalism. He was imprisoned along with many others after World War I for his pro-Communist sympathies. In prison he met and befriended many of the people who were later to become the leaders of Yugoslavia, including Josip BrozTito. He fought in the Anti-Nazi resistance among the Partisans (who unlike the ones in other parts of Eastern Europe were not anti-Semitic and openly welcomed Jews into its ranks). He quickly rose through the ranks and was appointed by Tito (who was an ethnic Croat) to suppress all 'counter revolutionary activities'. Pijade became so feared and hated by the Serbs (especially in places like Montenegro) because of his policies, that mothers would warn their children that if they misbehaved 'Mosa' would come and get them. What I find fascinating about Pijade is his ambivalence and the absence of outright hostility toward religion in general and Judaism in particular. This hostility towards Judaism as a religion was the hallmark of most of his Ashkenazic communist counterparts in Russia (though it should be pointed out that Pijade was certainly an assimilated Jew who didn't hesitate to marry out of the faith). This sentiment is clearly illustrated by what happened at the end of world War II. Some have suggested that the outright hatred for Judaism as exemplified by people like Leon Trotsky and Lazar Kaganovich was a decidedly missing factor in the Sephardic "version". This is something that can still be observed in contemporary society . It is not uncommon to see staunchly secular Sephardic Jews (who identify themselves as Communist, Socialist etc.) taking part in Jewish ritual and expressing reverence and respect for its cult . Another interesting figure is Avraham Benaroya, leader of the workers movement in Greece. Benaroya eventually emigrated to Israel where he died in 1979. Ben-Aroya’s organization was essentially secular, and many of its activities took place on Saturdays, including the publishing of its weekly,Avanté . This made for trouble with the local rabbis, who called upon Ben-Aroya not to encourage Jews to violate the Sabbath and even threatened him with excommunication. disaffected Sephardim  and had a decidedly socialist bent (some members later joined Israel's Communist party) and (perhaps disturbingly) openly sympathized with the American Black Panther movement . Though that is a post worthy in and of itself, I think the overwhelming purpose (and impetus) behind that movement was not soviet-style revolution but rather social justice and equality, it also definitely lacked the anti-religious component (many of its members were observant Jews, others were staunchly nationalist and anti-Palestinian) .
. In other parts of the Balkans, Communism was making inroads among the Sephardic youth as well. A friend recalls her great-grandmother telling her about the Jewish communists in her native Salonika "Some of them published newspapers, and one of the articles said that now that we have planes and have been in the sky, we can see that G-d doesn't exist,It really horrified my great grandmother. It's such a childish reasoning though".
. The Israeli Black Panther movement was modeled after its American counterpart though it differed sharply in many ways (It is important to point out that the American group often expressed virulent anti-Semitism). It was a movement founded and led by disaffected Mizrachi Jews (a disproportionate number of whom, were of North African origin). The Black Panthers were Israel's own version of counterculture figures and fighters for social justice, people like Charlie Bitton (former Knesset member of the Hadash, Jewish/Arab Communist party and now a graying man expressing Likud-like tendencies), Saadya Marciano (formerly Knesset member of the Sheli party and now a poverty-stricken man , and Avi Berdugo (who later made a good life for himself as an Attorney). I thank God that I lived to see the day that a Palestinian army fought an Israeli army. Now I can die. I dont need to see anymore. Apparently, in the middle east, the lines between communism and religion aren't as clearly delineated as they are in the west.